Dr. Daniel Helburn is a graduate of Brandeis University and The University of Vermont College of Medicine. Following an internship and residency at Beth Israel Medical Center in New York, he was selected as Chief Medical Resident. He pursued subspecialty training at Beth Israel by completing a fellowship in Gastroenterology and Digestive Diseases. 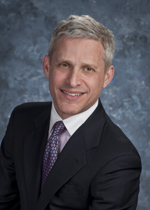 Dr. Helburns’ expertise as a gastroenteologist allows him to aid in the diagnosis and treatment of a variety of digestive disorders including: gastroesophageal reflux disease (GERD), peptic ulcer disease, inflammatory bowel disease, irritable bowel syndrome, diseases of the liver and pancreas, in addition to screening for colorectal cancer. He joined Hamden Internal Medicine Associates in 1994. He is a member of the Connecticut Medical Group. Dr. Helburn is board certified in internal medicine and gastroenterology. He has hospital privileges at the Hospital of Saint Raphaels and Yale_New Haven Hospital. He also has an appointment as a clinical instructor in medicine at Yale.